Polina Vladimirovna Born in 1919 into a working class, revolutionary family, her father was killed by counter revolutionaries, and her mother took part in the October Revolution and the Civil War. After the death of her husband, Polina's mother moved the family to Gomel where she worked in a print shop. Polya (Polina) had applied to flying school to fulfill a dream of becoming a pilot. Even though she was initially rejected because her height was 8 cm. too short, she eventually worked her way in. Reporting to the airfield, she was frustrated again because her diminutive stature did not permit her to make parachute jumps. Flying was absolutely out of the question, because her legs did not reach the pedals and her eyes could not see the horizon. When war broke out in 1941, she was in the 3rd year in the Faculty of History at Moscow State University. At first she signed up for a nursing course, gave blood and dug anti- tank ditches, but when the Komsomol Central Committee called for volunteers in the women's aviation regiment, she applied and was accepted. She was assigned to pack parachutes while her friends studied to be navigators. She persisted however, and when the Medical Commission declared her fit for the navigation group, an intensive three year program was squeezed into three months by fourteen hour days of both practical and theoretical study. One night in August 1942, the regiment received orders to bomb Pokrovskoy in the Kuban, the base for a large German contingent. On the flight back, Polina bombed three German fuel tanks near the railway station, thus destroying thousands of tons of enemy fuel an act which was not part of her mission. It was necessary to destroy the German searchlights which sighted Soviet planes for the anti-aircraft gunners at night. Polina successfullyknocked out their lights. As a result of her bombs, enemy bridges flew in the air, anti-aircraft guns were silenced, searchlights were extinguished and German vehicles on their way to the front burned. Navigator ght with the 46th Guards Night Bombing Aviation Regiment, with her flight log recording 869 combat flights, 1300 hours in the air, 113 tons of bombs released and 142 conflagrations caused. 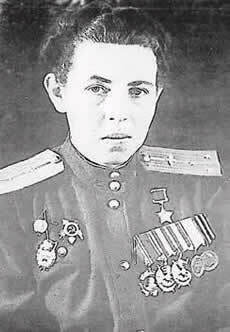 On May 15, 1946, the Presidium of the Supreme Soviet of the URSS awarded the title of "Hero of the Soviet Union" to Captain Polina Vladimirovna Gelman for heroism and valor displayed in the struggle against the German fascists. She lives in Moscow and teaches political economy on the college level.